Today only, save 30% off yesterday’s price on your choice of select Invicta Men’s Watches, each just $69.99. Choose from a variety of classic and sport styles. Plus, get Free Super Saver Shipping. Discount offer applies only to items shipped from and sold by Amazon. Offer good while supplies last. 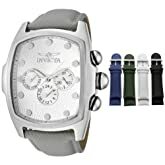 Get 30% Off Yesterday’s Price on Select Men’s Invicta Watches. Offer valid today only!